Additional Zoo photographs can be found on the Archives’ Flickr site. The origins of the zoo lie with the story of Franz and Louise Zinner who moved to Lebanon, PA from Weisenberg, Germany in 1899. They became good friends with their neighbors. Their neighbors soon left Lebanon to move to the western part of the United States. The neighbors soon shipped to the Zinners twelve prairie dogs. Franz Zinner wasn’t able to keep them in his yard in Lebanon and he also knew that Hershey was in the early stages of building a park. In 1905 he went to see Milton Hershey to speak to him about keeping the prairie dogs as a park attraction. Milton Hershey agreed and directed that suitable pens be built for the prairie dogs. Shortly after that these same friends sent a bear cub to Franz Zinner. Zinner met with Milton Hershey again and after a lengthy discussion the two men decided to build a zoo. Milton Hershey invited Zinner and his family to move to Hershey and take charge of the new zoo. Zinner actually had experience with managing wild animals. As a young man Zinner had gone on two expeditions to Africa catching wild animals for several circuses throughout Germany and neighboring countries. Franz Zinner served as the zookeeper until his death in March 1920. George Kreider succeeded him as the zookeeper. His length of service is unknown. The next known zookeeper was Ward Walker who was identified as the keeper in article of correspondence from 1934. He continued as the zookeeper until the zoo was closed due to manpower shortages. His contract was not renewed. When the zoo reopened in 1950, Clarence Moose was named zookeeper, with Raleigh Hughes as a staff person. Hughes was promoted to zookeeper in 1958, following Moose’s retirement. Hughes managed the zoo until it was closed in 1971. 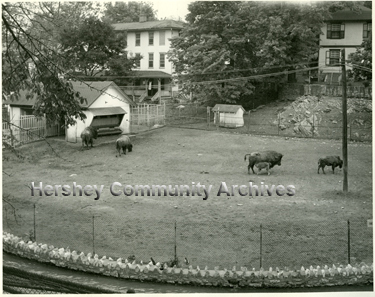 When the new Hersheypark Animal Garden (petting zoo) opened in 1972, Hughes was appointed supervisor. He retired from Hershey Estates in 1976. 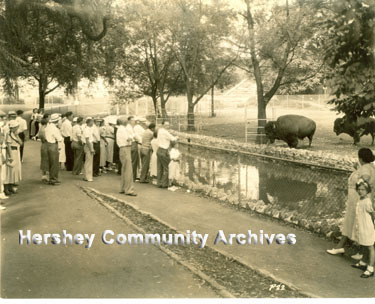 During Milton Hershey’s lifetime Hershey Zoo was a local attraction. Animals were added to the zoo because they became available or someone had a special interest in having a particular specimen in the zoo. In the era before television, zoos played an important role educating the public about animals and environments different than central Pennsylvania. The earliest animals acquired for the Hershey Zoo came through donations and personal relationships. After the prairie dogs and the black bear cub, the Hershey Press kept a running tally of the animals being acquired for the zoo. The first consignment of deer were delivered in early January 1910. William “Lebbie” Lebkicher seemed to have been particularly interested in the zoo and was often mentioned in conjunction with acquiring new animals for the zoo. The animals ranged from the mundane to the exotic. In 1910 the zoo acquired two black bears, a pair of zebus, a family of ‘possums, deer, angora goats, pheasants, three peacocks, and fox squirrels. The animals were often named. The bears in particular seemed to have captured the public imagination and were referred to by their given names, Bob and Montana. Some of the animals were treated more like circus performers and the zookeeper taught them “tricks” that they performed for zoo visitors. Animals that died were often stuffed and mounted for display. The zoo was fairly successful in breeding animals. In particular, there were frequent mentions of births of birds, goats, deer. From the beginning the Zoo sought to populate the zoo with exotic animals. Monkeys were a popular attraction. There were a wide variety of primates, including rhesus monkeys, woolly monkeys, spider monkey and golden baboons. By 1914, the Hershey Zoo had progressed and grown so that it was being described as the Hershey Zoological Garden. The first lion, “Minnie,” was added during the summer of 1914. In 1915 a Hershey Press article announced that the zoo was going to be enlarged. The Laundry was to be renovated to add cages for larger animals, including lions and a new leopard. A facility was designated as the Monkey House. Pens were to be created along the creek for different herds, llamas and other new animals to be added. In 1915, Hershey proclaimed itself the “largest free private zoo in Pennsylvania. The Zoo was entirely remodeled and a large central building was added in 1916. The next major change to the zoo did not take place until the 1930s. The 1930s were a period of growth and expansion for the Hershey Zoo. By the end of the decade the zoo covered forty acres and contained individual houses for primates, carnivores, small mammals, antelopes, tropical birds, pheasants, and fish as well as outdoor cages and enclosures. In 1934 the zoo added a Bird House. Descriptions of the facility lauded the ventilation system and the big glass-enclosed circle that made it possible to see all the birds at one time. That same year a reptile house was built to better show an extensive collection of poisonous snakes, crocodiles, alligators, turtles. 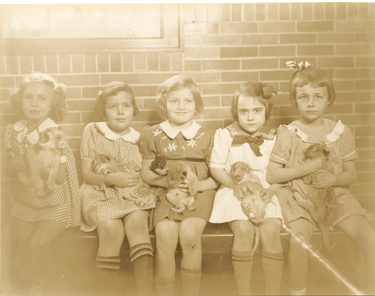 It was also in 1934 that a pair of baby elephants, 3 ½ years old were added to the zoo. The elephants were only at the zoo for a short time. George Bartels, Park Manager, related in an interview that the zoo keeper wanted to build a large, expensive building to house the elephants. Milton Hershey, who often visited the zoo, overheard a family discussion. The father said to his children, “Look, there is an elephant.” The youngsters said, “We want to see the monkeys.” And when Mr. Hershey heard that, he said,” People are more interested in monkeys than elephants, and I won’t spend the money on a building for the elephants. He said, “We’ll sell the elephant,” and the zoo soon did so. Even with the short lived tenure of the elephants, Hershey Zoo’s collection expanded significantly during the 1930s. Under the leadership of zookeeper Ward Walker, the zoo acquired a wide array of animals, ranging from penguins to Galapagos tortoises to anteaters, tapirs, sloths, anacondas and a variety of birds. The zoo was particularly successful in breeding animals in captivity. During the 1930s, several published articles enumerated the large number of species propagated at the zoo. The list of animals bred at the zoo was impressive: buffalo, elk, white tail deer, white fallow deer, spotted fallow deer, sika deer from Japan, zebu, aoudad, llama, grey timber wolf, coyote, raccoon, beaver, skunk, porcupine, African lion, mountain lion, leopard, Guinea baboon, Rhesus monkey and green monkey, orangutans. Jiggs and Maggie, the zoo’s orangutans were a particularly popular attraction. It was during the 1930s that the zoo was also used as a breeding ground to restock game (pheasants, quail and mallard ducks) on the Hershey farms. At some times during its history the zoo charged an admission fee. Most often if appeared to have been ten cents. In 1939 Hershey Zoo changed its admission policies to admit school children, free of charge, when accompanied by teachers. That same year the Zoo placed concrete statues in three locations (the three highway entrances to Hershey) to advertise the zoo. The statues featured five animals: a lion, tiger, monkey, bear and kangaroo. The statue also included information displays about the zoo and traveling directions. The statues were created by the Portaluppi Brothers, Egg Harbor, NJ. By the 1940s, more than 300,000 people visited the zoo each year. In 1941 the zoo set single day attendance records with 13,289 visitors. An earlier record of 12,004 people had stood since 1936. With the advent of World War II, Hershey Zoo closed on December 20, 1942 for the duration. Several factors contributed to the decision to close the zoo. The zoo staff of 30 keepers had shrunk to only 2 employees with the rest either entering military service or transferring to production employment. Without proper staffing the zoo was unable to properly care for all the animals. With concerns with being able to provide food for the carnivores, the Zoo sold them and several other animals to larger city zoos. The zoo facilities were converted to permit the raising of domestic chickens and ducks. It was during this time that the carnivore house was converted into the Trinidad Avenue Apartments. The zoo remained closed until 1950. On May 7, under the leadership of the new director, Clarence Moose and Raleigh Hughes, assistant director, the zoo celebrated its grand reopening. For the reopening, the zoo created a new monkey exhibit, installing it in the old bird hall. In addition to the monkeys, other animals in the zoo included antelopes, aoudads, wild sheep of northern Africa, black bear, bison, fox, wolf, deer, goats, llamas, and a variety of small animals such as hares, opossum, rabbit, raccoon, chipmunk, squirrel, skunk and ground hog. There were also a collection of birds: ducks, jungle fowl, emus, Chinese geese, hawks, owls, pheasants, parakeets, partridges, pigeons and a talking black crow. The reopening of the zoo also included the installation of a diversified wildlife education exhibit in the old reptile house near the main entrance gate. The exhibit was sponsored by the PA Game Commission. It featured a wide array of mounted animals, with each exhibit designed to illustrate a particular aspect of Pennsylvania wildlife. Hershey Zoo followed the fortunes of Hershey Park during the 1950s and 1960s. At first the zoo was able to add some additional attractions, most notably Monkey Island in 1954. But there was never any money to develop the zoo. Any animal additions were accomplished through donations and trading with other zoos and animal dealers. In 1967, in one particularly remarkable exchange, Hershey traded two Pennsylvania raccoons for two Australian kangaroos. The exchange quickly became a press event. Except for a brief period in the 1930s, the zoo was a free attraction during most of its operation. During the 1950s a petting zoo was added that charged a modest admission fee. Petting zoo rules about contact with wild animals were quite different than they are today. The decision to close Hershey Zoo was linked to plans for the new Hersheypark. The zoo closed in 1971 when Hersheypark moved to a one-price admission format as part of its restructuring into a themed amusement park. Plans for the new park included the development of an Animal Garden. Opening in 1972 the Animal Garden featured a new monkey island, a barnyard petting zoo and baby animals such as llamas and elephants. Apparently the Animal Garden was designed without much input from experienced zookeepers. The new Monkey Island was not properly designed and when monkeys were placed on the island, they quickly escaped. The Monkey Island was re-purposed as a geese pond. The old zoo was used to house the animals when they were not on exhibit in the Animal Garden. Ultimately Raleigh Hughes was brought in to manage the new facility. In 1975 John Strawbridge was serving a director for the Hershey Museum. He had a natural history background and saw the empty zoo as a great opportunity. Inspired by the Toronto Zoo, he developed plans and convinced Hershey Estates to invest in redeveloping the old zoo as a themed zoological park: ZooAmerica. By building a bridge across Park Boulevard, HERSHEYPARK was able to directly link the zoo to the park. Opening in 1978, ZooAmerica featured exhibits of animals native to North America, with naturalized animal habitats. While Strawbridge served as the zoo’s first director, Troy Stump was promoted to director in 1981. The zoo was divided into five sections over 11 acres: North Woods, Eastern Woodlands, Big Sky Country, Grassy Waters and Cactus Community. The exhibits featured more than 200 animals representing some 70 different species In promotional materials ZooAmerica was most often marketed as a asset of Hersheypark and described as another themed area of the amusement park. On March 9, 1982 ZooAmerica became one of only 50 zoos in the United States (and only two in Pennsylvania (Philadelphia and Hershey) to receive accreditation by the American Zoo and Aquarium Association. The educational focus of ZooAmerica was an important asset for Hersheypark. The zoo provided the park with opportunities to tap into school groups and field trips. These marketing efforts were often coordinated with Chocolate World and Hershey Museum to create a day long experience for students. Often a visit to Hersheypark could be included as a celebration or fun activity after the educational activities were completed. In 1981 a scholarship program was established, offering $500 scholarship awards to college students who competed by submitting an essay describing an experiment or project dealing with the natural environment. That first year 2 scholarships were awarded. While funding was limited for the development of new exhibits, ZooAmerica undertook a variety of novel marketing ventures to build a zoo audience. In 1980 the zoo launched “Creatures of the Night,” an educational alternative for Halloween. The first year the program ran on Friday, October 31. Visitors were invited to bring a flashlight and experience the zoo by night. In later years the event was expanded first to a weekend closest to Halloween. Zoo educators offered bat and snake demonstrations and a storyteller told ghost stories by a campfire By 1995 the event had expanded to 3 weekends and included selected rides operating in Hersheypark. The initial success of Creatures of the Night, encouraged ZooAmerica to expand its outreach activities. In 1982 ZooAmerica hosted a Spring Festival featuring a Wildlife Art Show and Plant Sale over an April weekend. In 1983 ZooAmerica launched the Greater Bear Jamboree Weekend. These weekends focused educational activities about the zoo’s black bears and also provided photo opportunities with other bear mascots: Smokey the Bear, Coco the Bear (hockey) and representatives of Good Bears of the World. In 1985 ZooAmerica began its tradition of a free community weekend held in January. In 1994 the zoo built a zoo infirmary to better care for the zoo’s occupants. The infirmary is staffed by veterinarians from the Hershey Medical Center. Over the years ZooAmerica often featured special temporary animal exhibits to attract new and returning audiences. Limited funds prevented any significant changes to the animal exhibits. Finally, in 2000 ZooAmerica opened a major new exhibit for bears. The bear habitat was moved and completely revamped, giving the animals a natural environment in which to roam. In addition, the “Black Bear Encounter” features a 13,000 gallon swimming pond for the bears. In 2001 the Zoo brought in a temporary exhibit of two albino alligators. In spite of financial restraints, the zoo staff have a history of being involved with wildlife conservation projects, including the breeding of a variety of endangered species (birds of prey, reptiles). Hershey’s ZooAmerica continues to succeed in honoring its obligation to protect its occupants while educating the public about them.